If you require more information about Rolleston Cricket Club, are interested in playing or maybe becoming a social member of the Club please contact the Secretary, Steve Cooper on 07739 760786 . 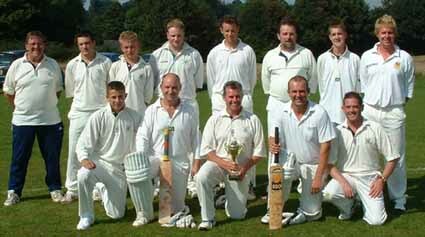 Pictured above is the 3rd team (2004 season) - winners of Division 7S of the Derbyshire County Cricket League. 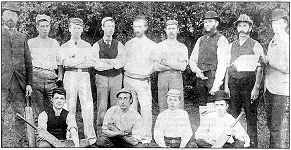 Members of Rolleston CC have been researching the club history and have traced it back to 1871. They are keen to find out more - including any information people might have about this picture found behind a portrait of Ernest John Sherratt and Agnes Emma Sherratt (nee Knight) who lived on Dovecliff Road. It could be the earliest known picture of a Rolleston Cricket Club team! If you can help please get in touch.